NEW YORK--(BUSINESS WIRE)--Bigger isn’t always better, especially when it comes to mattress prices. To celebrate its commitment to offering tiny prices married with luxe quality, home brand Allswell today announces the launch of its Tiny Home retail concept. The custom-built, highly-stylized and functional house on wheels will be open to the public for viewings and shopping. Featuring the brand’s cult-favorite mattresses among a bevy of shoppable bedding elements and social media-friendly vignettes, the home makes its debut in New York City on February 7, 2019 before departing on a coast-to-coast tour. 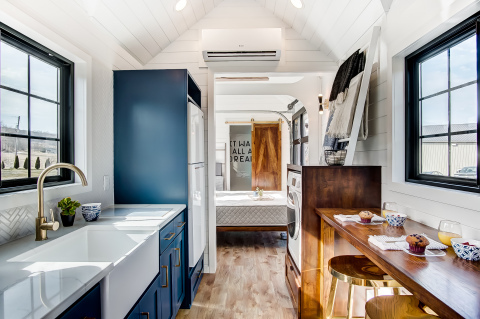 The 238 square-foot home, custom-built by famed tiny home builders Modern Tiny Living, is designed to remind guests of the comforts of home and the notion of feeling allswell. With four rooms in total, the fully operative and shoppable house showcases Allswell’s signature Luxe Hybrid mattress in the master suite and its lower price-point mattress, The Allswell, on a custom-built couch with storage and twin daybed, which can be transformed into an additional sleeping area. Upon entering the Allswell Tiny Home, visitors will be encouraged to pull a surprise promo code from a “Dream Jar.” As guests explore the Tiny Home’s quarters, they can shop and immediately buy the Allswell mattress and bedding items they see. The “Dream Jar” discounts will range from 10-20% off and unique codes ranging from $150-500 off. From a custom-tiled “It Was All a Dream” shower to a bird’s eye photobooth looking down on the master suite mattress where visitors cans pose among pillow props and customized signs, the Tiny Home is what social media dreams are made of. People will also be welcomed to enjoy the best comforts of home with complimentary coffee and homemade sweet treats. For those that just can’t get enough, an Allswell-designed tiny home will be available for purchase beginning February 7, 2019 on https://allswellhome.com/pages/tiny-home with a starting price of $100,000. 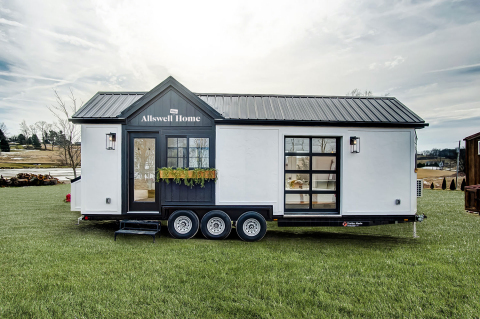 To follow the tour, see specific dates and locations and learn when additional stops get announced, visit https://allswellhome.com/tiny-home. The brand’s newest mattress The Allswell mattress features Hybrid technology, three types of performance memory foam, individually wrapped coils and added edge support. With a Queen-sized mattress starting at just $345, The Allswell disrupts the Hybrid category with unreal pricing for the value. The Allswell Luxe Hybrid measures a full 12-inches tall, comes with a built-in plush topper. It starts at $585 for a Queen. We believe everyone deserves to feel Allswell. At Allswell, we’re dedicated to offering high-quality products – starting with luxe mattresses and bedding – featuring innovative technology and unbelievable comfort at unreal prices. By charging less, we can serve more, redefining the new price of home luxury, and spreading the feeling of Allswell. Get inspired at allswellhome.com.